When Jimmy Page and Aerosmith team up to play a free concert on Beijing's Olympic Green in April, two pressing questions will be answered: Who's in Page's band, and who's singing for Aerosmith? AFP reports that the rock superstars will be joined by the Black Eyed Peas for a gig called the Show Of Peace to mark Earth Day on 17 April. "Tickets are free," said promoter Rick Garsen. "You can't charge for peace and green. It is going to be for everybody, it's like China's gift to the world and the people. "What we are going to do is raise money, obviously, from sponsorship, international distribution, merchandising, Internet, ringtones, DVDs, CDs," Garsen added. "That's how we are doing it, it is being self-funded as we speak." Although Page, Aerosmith and the Black Eyed Peas are the only acts confirmed at this point, organizers are also talking with other artists about performing, such as Pearl Jam, Lady Gaga, Green Day and 50 Cent. Numerous Chinese musicians are being brought in, as well. 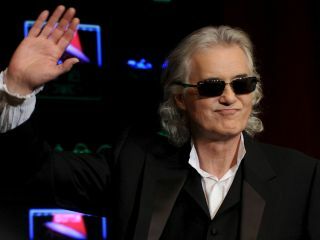 "My belief in music as a universal language is the reason I returned to Beijing to voice my support for the Show Of Peace," said Page, who performed Led Zeppelin's Whole Lotta Love at the closing ceremony of the Beijing Olympics in 2008. "This [concert] is a tribute to the power of music and its positive effect," said Page. "Music has been one of the most powerful languages that speaks to the heart of the people around the world. ".